GENEVA, NY—The Geneva Music Festival (GMF) has been awarded an Art Works grant from the National Endowment for the Arts (NEA). Art Works is the NEA’s largest category and “focuses on funding the creation of art that meets the highest standards of excellence, public engagement with art, lifelong learning in the arts, and strengthening of communities through the arts,” according to the NEA. The award supported the GMF’s 2017 performances and educational activities. The 2017 Season of the GMF took place from June 1 through 18, with a record attendance of 1,150. Over the course of three weeks, acclaimed artists presented a wide range of musical genres, including chamber, classical, organ masterpieces, bluegrass, and a two-concert celebration of jazz. Concerts took place throughout the region, in Geneva, Auburn, Canandaigua and Skaneateles. 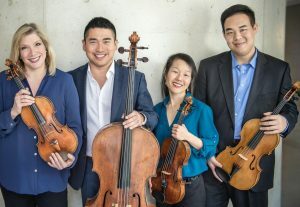 The Cavani String Quartet, the Quartet-in-Residence at the Cleveland Institute of Music, opened the season with a concert at the Gearan Center for Performing Arts. This year also featured critically-acclaimed violinist Jinjoo Cho, organist Ray Nagem, New Morse Code, and performances by GMF Artists-in-Residence. The chamber music finale with cellist Clive Greensmith and violinist Ani Kavafian was a sold-out show. Additionally, a free Father’s Day bluegrass concert was held for a full house at Ravines Winery. The 2017 Season of GMF also included a special, two-concert celebration of jazz featuring La Voz De Tres and the Thomas Bergeron Quartet. Multi-instrumentalist Paul McCandless was a guest performer at each of the jazz concerts. The festival has conducted community outreach in local schools since its inception. This year, GMF founding artists performed for high school student orchestras and held a master class at St. Peter’s Community Arts Academy, among other activities. Founded in 2011 with the mission of entertaining, inspiring and nurturing a lifelong love of music in the community, the festival annually presents artists whose work will appeal to audiences of a variety of ages and musical tastes. During its spring funding, the NEA awarded 1,195 grants totaling $84.06 million to organizations in all 50 states. In the music category of the Art Works grants, which includes the GMF, the NEA awarded 135 grants totaling $2,580,000. The list of award recipients is available online: www.arts.gov. The Geneva Music Festival is made possible, in part, by public funds from NYSCA’s Decentralization Program, administered locally by Finger Lakes Community Arts Grants (FLCAG) and CNY Arts, Rochester Community Foundation, Wyckoff Family Foundation, Geneva Rotary, the City of Geneva, Williams Family Foundation, Sands Foundation, Delavan Foundation and the Spring Hill Fund. More information is available online: www.genevamusicfestival.com.